SiTE:LAB Rumsey Street Project 2015 + 2016 is a catalog that documents two years of the "SiTE:LAB Rumsey Street Project," a partnership between SiTE:LAB, an all-volunteer nomadic arts organization, and Habitat for Humanity of Kent County in Grand Rapids, Michigan. The two exhibitions, during Artprize 2015 and 2016, featured large-scale, site-specific projects responding to multiple vacant structures. Essays featured are by Gregory Volk, Jessamyn Fiore, Joe Becherer, Dan Cameron, Lisa Freiman, Steven Matijcio, and Elizabeth VanArragon, as well as statements by the artists. 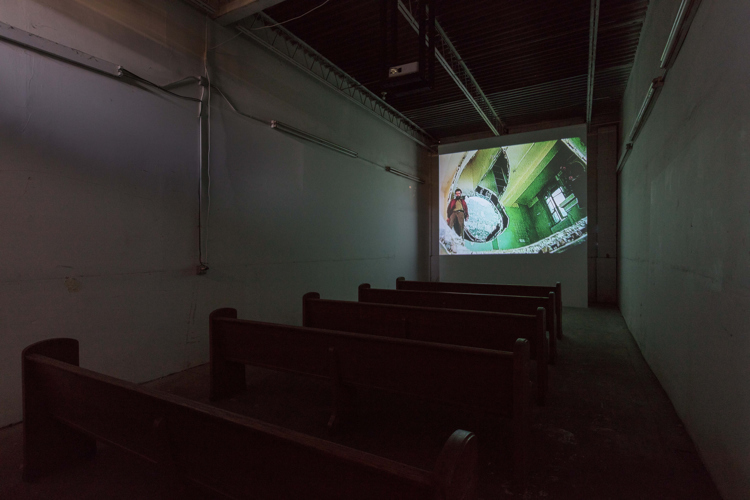 In this essay excerpted from SiTE:LAB Rumsey Street Project 2015 + 2016, New York-based art writer and freelance curator Gregory Volk details the visceral experience of encountering SiTE:LAB for the first time during ArtPrize Eight at their "Rumsey Street Project" installation. In 2016 I was invited as an outside art professional to Grand Rapids, Michigan to visit ArtPrize, see and experience artworks in this sprawling, citywide exhibition, and then discuss on local television, as part of the Critical Discourse series, finalists in several categories selected by both art experts and the general public. What this meant is that I had to focus on the finalist works, but as I scouted through the city taking in as many artworks as I could, I came upon a non-finalist house that was at once precarious and exquisite, magical and threadbare; an old, rickety house that Julie Schenkelberg had altered and sculpted, inside and out. I was riveted. White fabric billowed from various apertures. Slots in the façade offered glimpses into the interior. You could look at this house but also, quite literally, through it, to the surrounding environment. When I visited no one was allowed to enter. Still, I pulled strings and made a beeline for the artist, who graciously ushered me inside. Traces of the former inhabitants, including scruffy posters and newspapers clippings on the walls, combined with Schenkelberg’s myriad alterations: a gorgeous circular cut she had made from one wall and installed in a room facing a window, debris swept up just so, openings she had meticulously made in the walls. Part found structure and part made sculpture, this altered house, starkly alone on a vacant lot, was altogether enthralling, and if I had had a powerful vote I would have named it, then and there, the top prize winner. SiTE:LAB moving the house for Julie Schenkelberg's project. I didn’t know much at the time about the innovative, itinerant, and at times miracle-making SiTE:LAB, which sponsored and made possible Schenkelberg’s remarkable work, and also hosted 14 other nearby projects, but I sure took notice; the various artworks in the Rumsey Street Project were, for me, by far the most compelling part of the whole exhibition. For one thing, I discovered that SiTE:LAB had—somehow, in some way—moved the entire house quite some distance from its original location, where it became the perfect site for Schenkelberg to make her gritty, oddly delicate magic. At that point, I was all ears, and eyes. 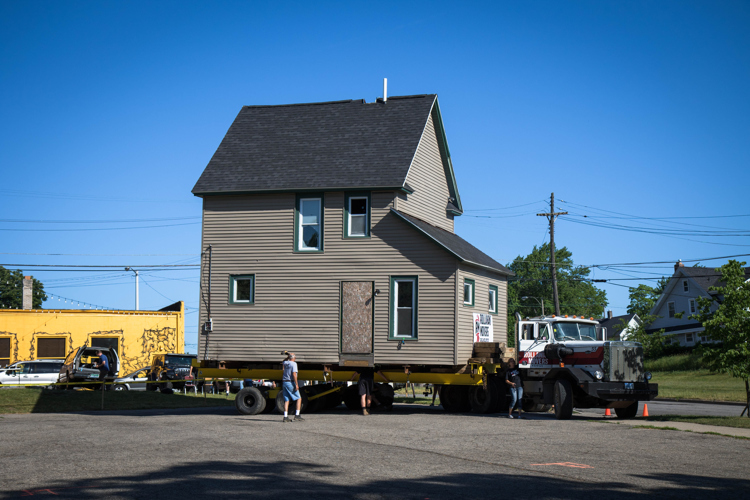 I mean, what kind of arts organization hoists an entire house up, moves it, and offers it to an artist so that she could make a dream work, a work impossible to realize in almost any other circumstance? Now, I am completely smitten. SiTE:LAB’s idiosyncratic and refreshing mission involves finding novel and compelling ways of inspiring and presenting ambitious artworks not in the art world but instead in the world, in this case sites in and around an entire city block on Rumsey Street. The works responded to and revitalized this off the beaten path—to say the very least—part of Grand Rapids. 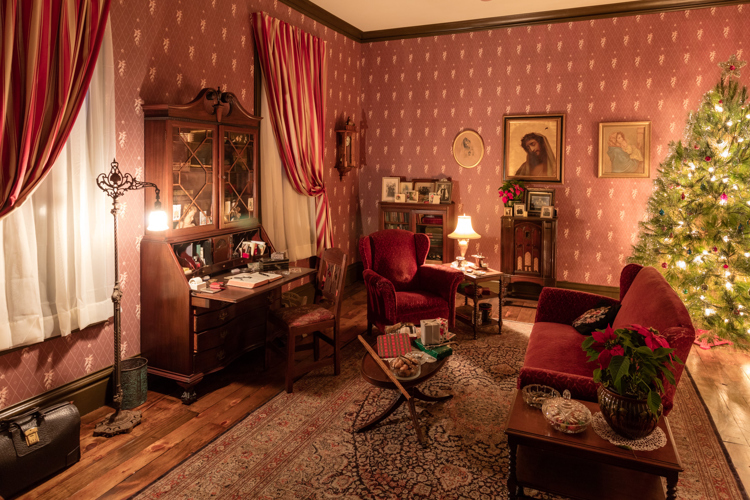 In a former rectory, Mark Dion, an absolutely brilliant artist who is a master at dealing with history and sites, transformed the former residence of a Catholic priest into a convincing 1930s period room in a museum (although this was no museum, instead a semi-decrepit building). You felt the long dead priest might return any moment to this domestic setting, with its knickknacks, decorations, furniture, religious paintings, and illuminated Christmas tree. 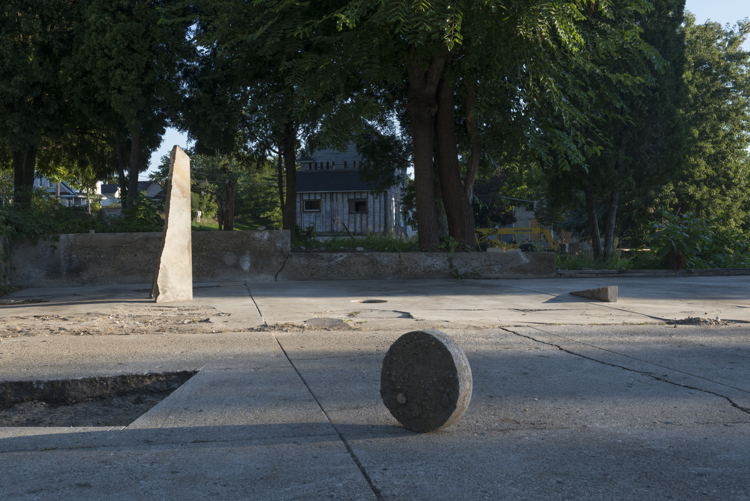 William Lamson’s minimalist outdoor sculptures, made by excavating and repositioning parts of a concrete foundation, were thoughtful and compelling and hinted at the vanished building that had once occupied the site. 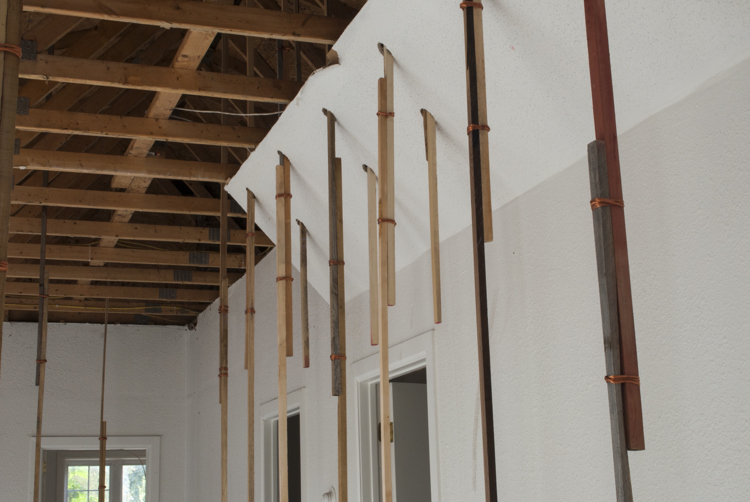 Colombian Ana Belen Cantoni’s wood construction in and atop a house was startling and wonderful. Not ArtPrize entries, but a major part of SiTE:LAB’s Rumsey Street Project exhibition, were four short films by the visionary and influential Gordon Matta-Clark (1943-1978), a pioneer of site-specific work and architectural interventions. Including these films, in relation to the other site-specific works nearby, was insightful and completely apt. It’s also a safe bet that many visitors were encountering works by Matta-Clark for the first time, making this ambitious project by SiTE:LAB all the more valuable. Working directly with artists, understanding and supporting their idiosyncratic visions, and finding ways of realizing unusual projects is exactly what SiTE:LAB excels at, which is why this scrappy outfit is so important and should be treasured, and not just in Grand Rapids. Releasing artists and artworks from what artist and writer Robert Smithson once termed “cultural confinement”—for instance heavily curated shows that are ultimately more about curators than they are about artists (and there are many such shows), and from neutral, usually white museum gallery spaces with their aura of hushed seriousness—and allowing both to operate in and engage with the rough and tumble world at large is both refreshing and exceedingly welcome. Excellent artworks have a different “charge” (that’s the term Smithson used in his 1972 essay “Cultural Confinement”) when you encounter them not in a museum, with all its protocols and learned behavior, but on the streets and in weathered buildings, in a faltering former rectory, or as a solitary house inexplicably perched on a vacant lot. Julie Schenkelberg had a gorgeous, tough to realize idea; she wanted to transform a house into a complex sculpture. SiTE:LAB found the house, moved it so that it would appear as both a house and large-scale sculpture, and Schenkelberg made her wondrous transformation, resulting in what was for me the best and most compelling work in all of ArtPrize. Count me now as an impassioned supporter of SiTE:LAB, with its devotion to transformative artworks realized in what are often unorthodox and surprising sites.